I’m writing this blog shortly after returning from our first, Annual, AFA Conference, which took place on Thursday 28th March at the Jury’s Inn in Oxford. I have to admit I’m still buzzing from it, as it really was fantastic, and the feedback we’ve already received from attendees suggests they agree! 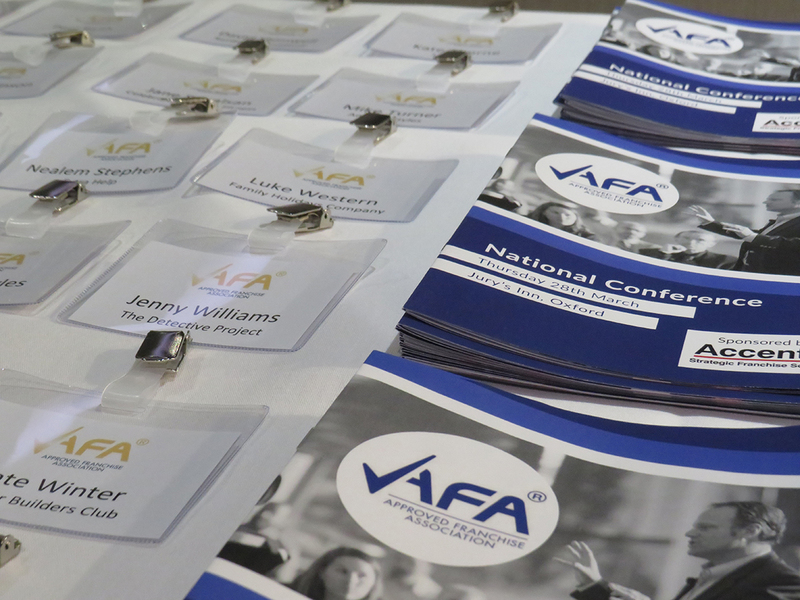 The number of attendees exceeded our expectations and I was particularly encouraged by the many AFA members who made the effort to attend. I opened the conference with an introductory speech about the AFA, our progress to date and why I decided to get involved with it, then handed over to our keynote speaker, Ben Kench, author of ‘Selling For Dummies’ and the UK’s No.1 Sales and Business Growth Specialist. A highly energetic and engaging speaker, Ben was full of life, as always, darting around the room like the Duracell Bunny, which kept everyone highly entertained! His speech included information about franchising, costs and how to ensure you sell your franchise at the right price. After a short break, we began the speed mentoring sessions. The attendees were split into six groups and each table was hosted by a different mentor. The mentors sat with each group for twenty minutes, beginning with a ten minute talk, leaving ten minutes free for questions and answers. This was our attendees’ opportunity to talk to our mentors about issues that were relevant to their own businesses and gain advice. Each mentor then moved onto the next table and began the process again. After this, we held a drinks reception, where attendees had the opportunity to network with their fellow franchisors and partner members over canapés and a glass of fizz. Celia Delaney then took to the stage to announce our forthcoming AFA Awards, which are being held on 19th September at the Jury’s Inn in Milton Keynes and will be hosted by Celia herself. As well as announcing the categories, she explained the nomination process and how people can apply to win one of our very special awards, which are open to the entire franchising community. More information on the AFA Awards is available at www.theafa.org.uk/awards. Previous PostPrevious Would you like to run your own messy play business?